Periodic Cash LTD is a program that might attract as well as scare away many. Why? This is a short-term HYIP offering three investment plans. The first one offers 0.89-0.93% hourly for 5 days, the second - 1.5-1.75% hourly for 3 days, and the third - 2.5-3% hourly for 2 days. For all three plans, the initial deposit is included in the payments. The minimum and maximum investment limits vary within the investment plans – the first plan with 0.89% hourly is available for investments between $10-$499, 0.93% rate for $500-$2000. The second plan, 1.5% rate is available for investments between $500-$1999, 1.75% rate for $2000-$10000. While the third plan accordingly 2.5% for $2000 - $9999 and 3% $10000 - $50000. Withdrawals can be made during the investment term and users don’t have to wait until the end of the plan. 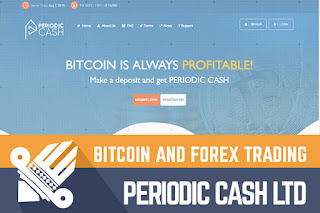 Periodic Cash LTD accepts PerfectMoney, Payeer, Advcash (via Payeer) and Bitcoin. Withdrawal requests are processed instantly. The minimum/maximum amount for automatic withdrawal is $0.01/$1000. The maximal daily withdrawal for each user is $5000. 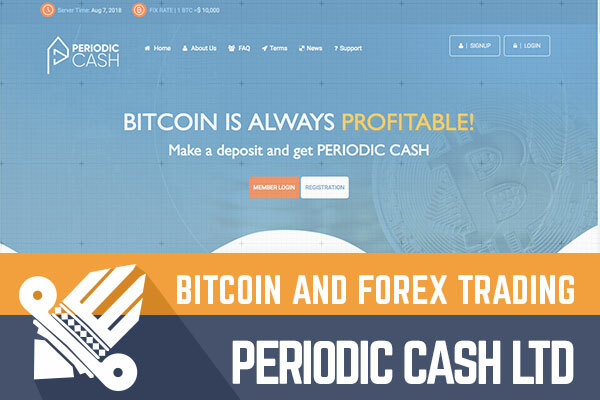 Periodic Cash LTD calls themselves a team of professional traders that make profit in the Bitcoin market and the Forex market using trade robot software. Like many cryptocurrency mining inspired programs, Periodic Cash LTD also offers investors to make a profit in the industry were without specific knowledge, experience and technical support is hard to get involved and even more – earn something. Whether or not this is what the admins really do, this story at least might sound real to some potential investors. Still, everyone must make his/her own decision about personal legend preferences and how much it has to do with the potential to make a profit. We see here collapsing well-written legends and very poor-quality websites. The website of Periodic Cash LTD is a standard HYIP website but looks solid to me, especially the user dashboard. The website itself does not provide users with a lot of information (not the best FAQ either) yet it is not stuffed with unnecessary and entertaining information. Sometimes too much is literally too much. Admins are using only a few selling points, that work – worldwide accepted (in terms of payment options), easy to set up and completely transparent. Can’t comment much about the transparency, however, the batch numbers are displayed and that is great. I would like to add that registration and the process of making a deposit was simple and fast, withdrawals are instant. Simple and user-friendly personal cabinet. Do you have anything to share about the website of Periodic Cash LTD or the program? Share your thought in the chat box below! As I already mentioned you cannot find a lot of information on the website – no names of CEO etc. In fact, why would any admin put their real names due to the nature of their business? However, admins have chosen a classic approach to build trust by placing a certificate of incorporation on the website. Feel free to check the company number on the Companies House website to check the company’s data. Keep in mind that such certificate can be easily made and doesn’t require enormous effort. It’s more like a homework that some admins still tend to do to make the program look good. In case you want to find out more about the program (keep in mind – it’s a story) visit the website to see info about the total deposit, users, latest deposits, and withdrawals. What can we find online about Periodic Cash LTD? For a 5-day old program, people are discussing a lot. I assume it’s because the program at first glance looks like offering interest rates worth calling HYIP, but after a better look, you realize that plans with the most affordable minimum deposit would generate only 6,8% net profit within 5 days. However, I didn’t find anything worth sharing that would help in to make any decisions, users just share their investment and withdrawal info, as well as discuss instant withdrawal option and it’ s limits. According to Alexa rank, the main visitors are from Morocco, Vietnam, Russia, and Ukraine. So, let's get to the most important part – the investment plans. An investment calculator for each plan is available on the website. However just to make it easier to understand what’s what here a quick calculation is. For example, an investment of $200 in the first plan (0.89% hourly) would generate a daily return of $42.72. With 0.89% hourly for 5 days, the break-even point is reached after approximately 112 hours, which is 8 hours before the end of the term. And at the end of the investment term, a $200 investment would have made a net profit of $13.6. Of course, in case the program will last 5 days after the investment. Sure, there are plans with higher interest rates, but also minimum deposits are much higher. Today we are looking at a program with short-term plans that can attract as well as scare away many. On one hand deposit terms are much shorter but on the other hand, the return for $200 deposit is only 6.8%. Sure, for deposits $2000 and higher it’s a 44% return but the stakes are very high. As I am writing this review the first cycle should be ended at least for the two and three-day plans. In case there is anyone who already made some profit among our readers, drop a message in the chatbox about the performance. To me, this program looks fine now. How will this short-term HYIP work in the nearest future? It’s impossible to predict it. Therefore, remember that any HYIP is a high-risk investment and if you ever decide to make any investments, don’t invest more than you can afford to lose! Have you already made an investment in Periodic Cash LTD and have any useful information to share with us? Please drop a message in the chat box to share your experience! Investment plans: 0.89-0.93% hourly for 5 days, 1.5-1.75% hourly for 3 days, 2.5-3% hourly for 2 days. Initial deposit included in the payments. Join Periodic Cash LTD Here!